Teaching with Grace: 5 on Friday... there's a treat on the end! I'm linking up with Doodle Bugs Teaching for 5 on Friday! Super excited that it's Friday! My son is playing soccer again this year and his schedule (plus kindergarten for him and me) are making it crazy busy around here! I'm insanely excited because he has pictures for Saturday's game! I can NOT wait till next week! It's the end of our 9 weeks so we have a weird kind of week next week. 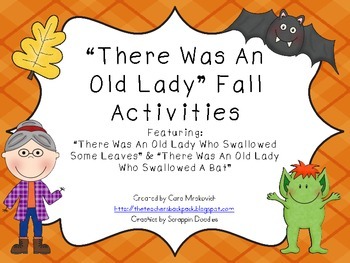 But it allows for some fun theme activities with 'There Was An Old Lady Who....' I'm using Cara's ah-mazing pack! There is an adorable craftivity, two different little books, AND retelling cards for a pocket chart. So adorable! 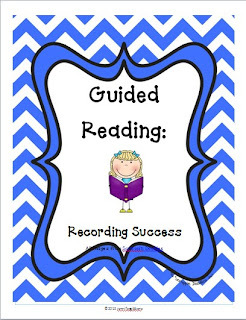 I'm loving Guided Reading group this year. I never thought I would say that but my kiddos are so sweet and they are SOOOO excited about it! We are using Rigby books that we ordered last year. They are really nice plus I'm using these great recording sheets that are helping me keep track of who has what book and who hasn't brought them back yet. I'm loving that it's fall. It's definitely my #1 favorite season! I am checking the weather daily to see if it's cool enough for my boots and sweaters! I've already snuck (yep a real word there! I just googled!) in a couple of sweaters here and there that allow for pushed up sleeves. This is for all of you wonderful follwers: new and true! I love you all and wanted to say thank you! You can win a Starbuck's card to help you usher in the (best) season ever! I don't drink coffee, but it's okay because I love the caramel apple spice. Fun! Thanks for the sweet giveaway! I love hazelnut steamers and pumpkin spice lattes! Well, I don't drink coffee, but I do LOVE their Chai tea lattes and hot chocolates!! Your son looks adorable in his soccer uniform! I LOVE coffee and Starbucks Lemon Pound Cake is AH-mazing.